Large Dynamics 365 for Customer Engagement apps organizations that synchronize their data with external data sources can now enable entities for change tracking. You can export or retrieve a selected set of Customer Engagement apps data, and then keep the external data warehouse in sync. By selecting, or deselecting, change tracking for specific entities you can reduce the load on your server resources and save processing time when extracting Customer Engagement apps data and synchronizing it to an external store. You can enable change tracking for both system and custom entities. Go to Customizations > Customize the System. 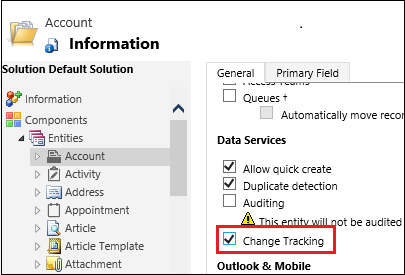 Select an entity, and under Data Services, select the Change Tracking check box.